To perform this trick, you must first ensure that you can hold a pack of cards in a relaxed way. This implies that you must have swift movements while dealing with cards. You have to guarantee that you can influence your audience well. First and foremost, get yourself to practice basic shuffle. After mastering this, go onto more flashy strokes. This will infuse enthusiasm in your audience such that your tricks will be more believable. Practice makes a man perfect, one of the oldest and wisest statements for we learn. So practice more and more till you master this unique skill. Once you become perfect in the card shuffle movements and strokes, you are ready to learn how to perform a false cut move. For this move, you will require to hold the pack of cards between the index finger and the thumb. With the free hand, remove the fourth bottom as well as fourth top section from the pack of cards. Now, interchange the two parts such that the top part becomes the bottom and bottom becomes top. Ensure that you place a thumb gap at each side. Keep repeating the same action till you get back the top and bottom parts back to their respective original places. As practice will always enhance your skills, therefore continue to practice this step till you succeed in doing this with your eyes closed. Now you have to get a volunteer to select any card from the pack. Now make your volunteer memorize the card without showing it to you. After this, ask him to replace it on the top of the pack. After this, begin to perform false cut moves once again. Once the fourth top as well as bottom sections are back at their respective positions, place the pack of cards on a table and wave a hand on the cards in a magical movement. Having done so, ask the same volunteer or someone else to reveal that card which is the topmost. It will be the card chosen by the volunteer. The most important step here is the false cut moves after which you can do the trick with aces as well. For this, you have to ensure that the aces are placed as the top fours cards in the pack. 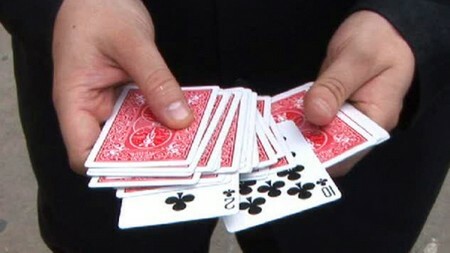 Now, perform the magic trick by shuffling the cards with false cut moves. Soon after the cards are in their respective original places again, slightly wave your hand like a magical movement and reveal the top four cards as aces. If you want to completely astound your audience, mix these two tricks with each other. So go ahead and amaze friends and family with this trick. After all, magic tricks are a very amusing way to interact with all. Go ahead and try some new variations. After all, magic has no limitations. All you need is creativity, imagination and the practice to create illusions. So get going and all the best!